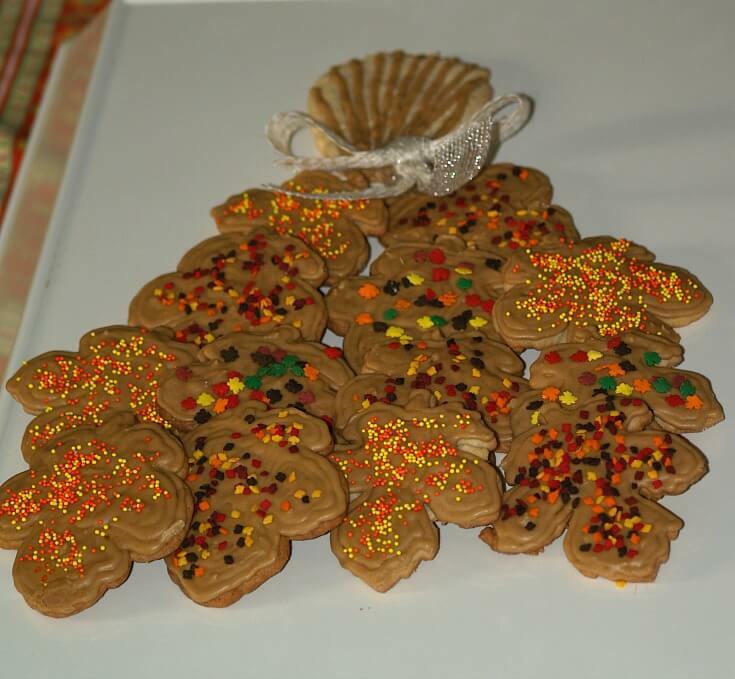 I have always loved to make new recipes for fall cookies. This is my favorite time of the year but it never lasted long enough in Ohio. I tried to make the most out of the time I had. I started making special cookies when my kids were little. After they started school I liked to surprise them with fresh cookies when they came home. When you have a bunch of children, life is pretty busy during the summer months. Not only is it much cooler but while the kids were in school I had a little more time to think about and bake cookies. Many of my recipes for fall cookies are inspired by all the locally grown products from harvest. Mostly these were grown and harvested from my area of Ohio such as pumpkins, squash, black walnuts and apples. 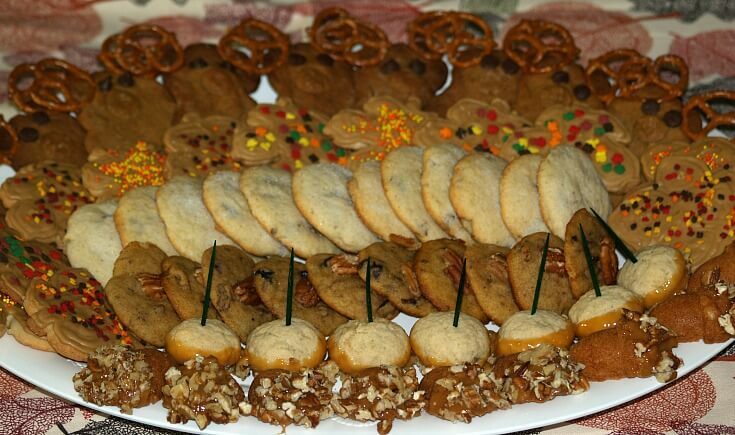 The most popular recipes for fall cookies as well as other holidays are good sugar cookies. They are so versatile and can be decorated for any occasion. I would say this is my most traditional cookie. Of course, the first sign of fall is the beautiful color changing leaves. I cut the cookies in leaf shapes and frost them in fall colors. 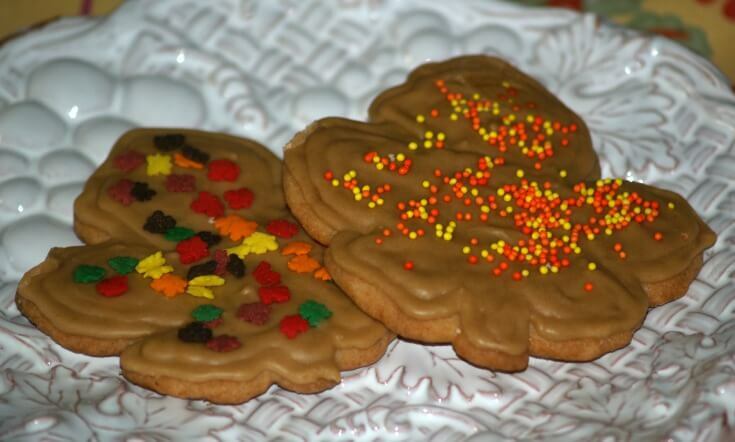 My recipes for fall cookies start with sugar cookies in colorful leaf shapes. Combine in mixing bowl the butter and shortening; cream on medium speed. Add half of the flour; beat in sugar, egg, milk, baking powder, vanilla and salt. Stir in remaining flour; divide dough in half, cover and chill 3 hours. Roll dough on lightly floured surface to 1/8 inch thickness. Cut leaf shapes about 2 ½ inches in size. Bake 7 to 9 minutes; cool on tray 1 minute and remove to rack to cool. Frost with favorite colors of cookie icing or decorative candies). When deciding on recipes for fall cookies, check the ground when admiring the colorful leaves. The ground in most wooded areas will be covered with acorns in the fall. The squirrels love to eat them and it is a great idea for cookie shapes. NOTE: I baked some in the mold and some done by shaping from a ball so you can see. Heat and stir butter and brown sugar in medium saucepan until butter melts. In a large bowl combine flour and baking powder. Add the vanilla, egg and brown sugar mixture; blend mixture well. Shape into 1 inch balls (I use 1 tablespoon); place 2 inches apart on UNgreased cookie sheet. Pinch one end of cookie dough with fingers; bake 12 to 15 minutes until golden. NOTE: If you have acorn shaped cookie pan you can use it for baking. Place cookies on rack to cool completely. Melt caramels in top of double boiler; stir in the water. 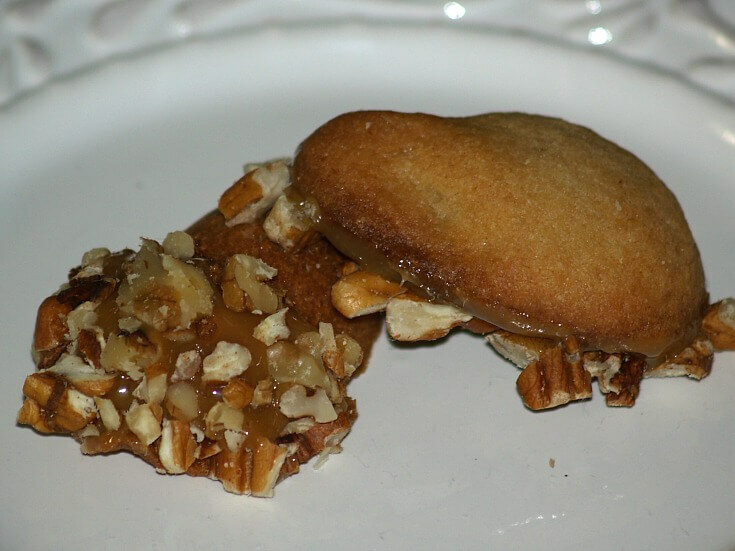 Dip flat end of cold cookie into caramel; dip into chopped pecans. Place on wax paper to set; makes about 46 cookies. Sometimes for recipes for fall cookies, my inspiration comes from looking forward to the approaching holidays. Although turkeys and deer are associated with Thanksgiving and Christmas, they remind me of the plentiful wild game roaming free in the fall. Recipes for fall cookies can be made the easy way by purchasing the products or make cookies and caramels with home recipes. To assemble each cookie turkey place chocolate star on work surface with point side up. Place 1 caramel on microwave safe wax paper; microwave on HIGH 5 to 10 seconds. NOTE: Want caramel to be ONLY slightly softened. Place softened caramel on tip of chocolate star pressing down to stick together. 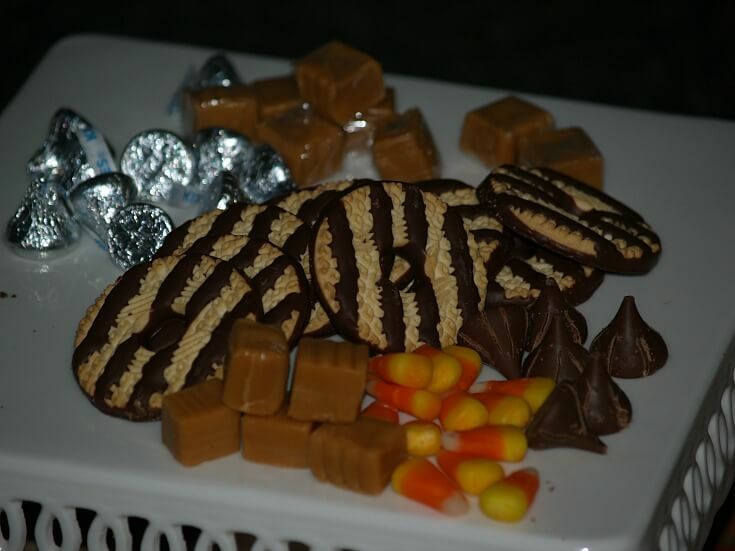 To make feathers press a cookie (Stripe forward) firmly against softened caramel. NOTE: Turkey should stand upright. 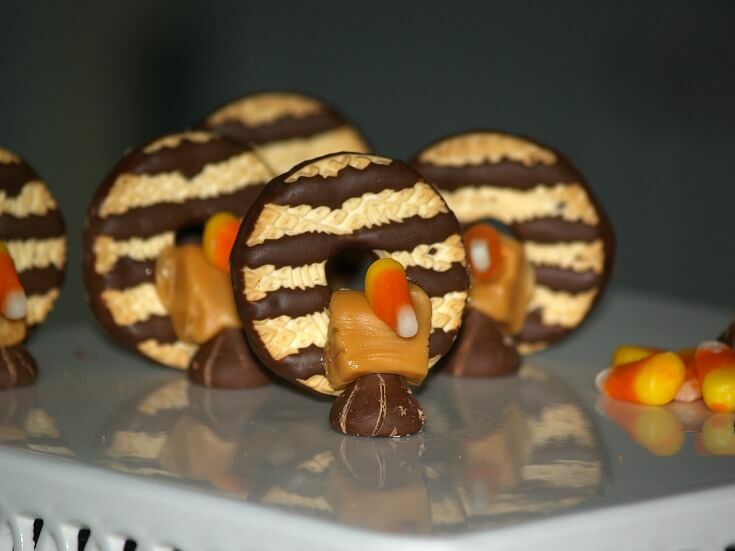 Press candy corn on top of caramel to resemble turkey’s beak. Repeat process to make 12 turkeys. Combine butter, brown sugar and molasses in a saucepan. Cook and stir over medium heat until butter melts and sugar dissolves. Pour into a large mixing bowl; cool 5 minutes. In another bowl combine flour, cinnamon, ginger, soda and cloves. Add egg and vanilla to the butter mixture; mix well. Add the flour mixture to the butter/ egg mixture; beat until well blended. Divide dough in 3 parts; wrap in plastic; chill at least 2 hours. Roll dough to 1/8 to ¼ inch thickness; cut into 2 ½ inch rounds. 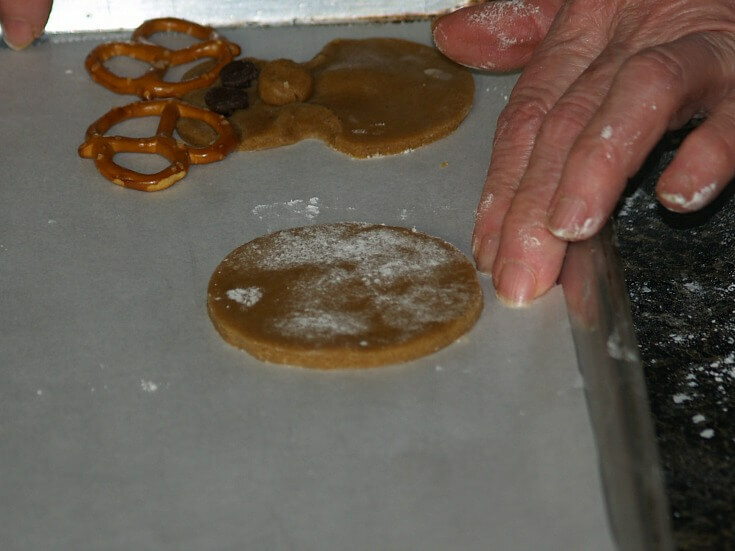 Place rounds on parchment lined baking sheets. Pinch rounds 1/3 way down circle; top forming head and bottom forming body. 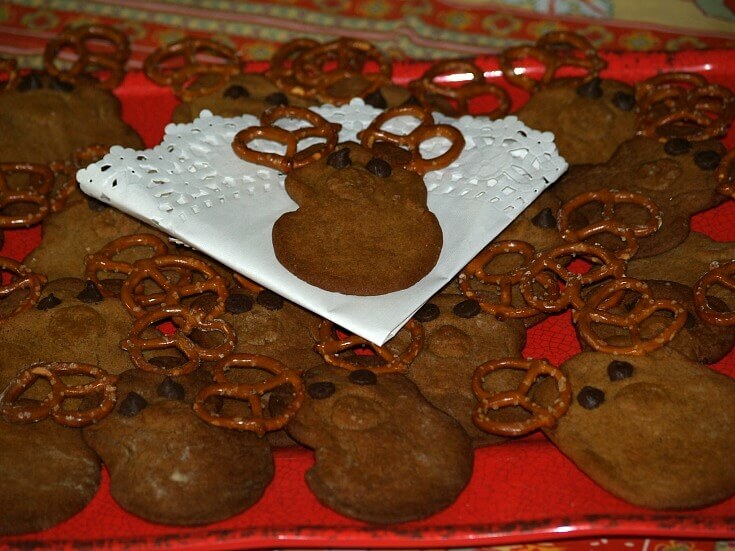 Press 2 pretzels on head for the antlers; press 2 chocolate chips for eyes. Shape a small ball of dough for the deer’s nose; dampen with water to adhere. Recipes for fall cookies often incorporate more than one harvest ingredients like cranberries. Fall is the only time I can buy fresh cranberries so I buy enough to last all year preserving by drying or freezing. Place flour, baking powder, cinnamon, soda, salt and allspice in bowl; blend well. Cream butter and sugar in large bowl with mixer on medium speed until fluffy. Beat in pumpkin, egg and vanilla; gradually beat in flour mixture until blended. Stir in chopped pecans and cranberries; drop by tablespoon on ungreased cookie sheets. NOTE: Place mounds about 2 inches apart for spreading. 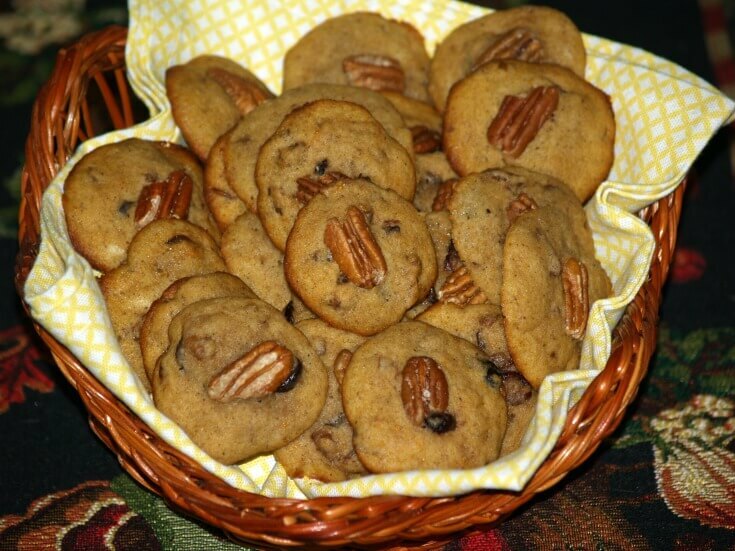 Flatten mounds slightly with back of spoon; press a pecan half in center of each cookie. Bake 10 to 12 minutes until golden brown; cook on pan 1 minute then cool on rack. When completely cold store in tightly covered container at room temperature. 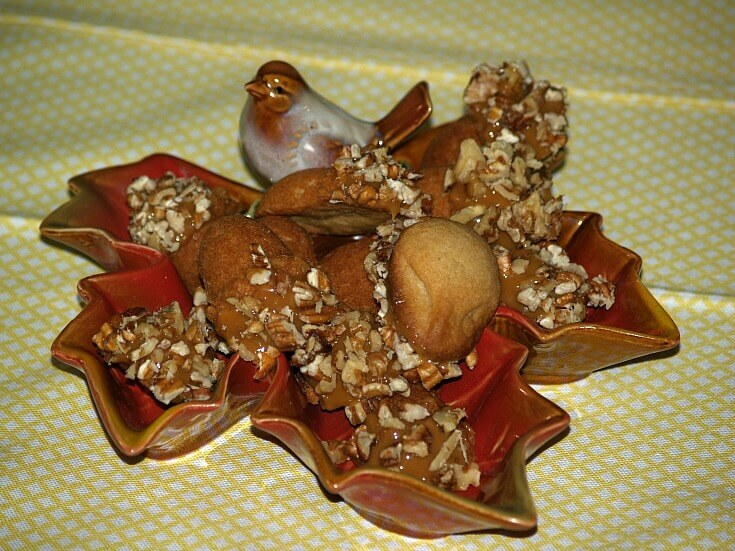 Many recipes for fall cookies are made with black walnuts. They are so abundant in the eastern half of the United States in the fall. Where there is a walnut tree walnuts will be covering the surrounding area. Many people will give them to you if you pick them up and they are so expensive to buy. Cream margarine and sugar together; beat in the eggs. Mix together the whipping cream and vanilla; add to creamed mixture. Add baking powder, soda and walnuts to 1 CUP of the flour; add to mixture. Work in REMAINING flour 1 cup at a time to make a soft workable dough. PREHEAT OVEN TO 350F degrees; line baking trays with parchment paper. Roll dough to 1/3 inch thickness; cut in rounds and place on prepared tray. Sprinkle tops of cookies with sugar; bake about 10 minutes. NOTE: Tops should spring back when touched; makes about 80. If looking for recipes for fall cookies, they are endless when it comes to apples. Most apple recipes are so moist and delicious. Toothpicks NOTE: I dye my toothpicks green with a little food coloring and lay them out to dry. FOR FILLING combine ingredients in small saucepan. Set off heat to cool. FOR DOUGH cream butter and sugars until light and fluffy. Beat the egg and vanilla into the creamed mixture. Combine flour and salt; gradually add and mix into creamed mixture. Place ¼ teaspoon of filling in center; fold dough over and reshape into ball. Place 1 inch apart on greased cookie sheet. Bake 12 to 15 minutes until lightly browned; cool on rack. FOR TOPPING combine caramels and milk in saucepan. Stir over low heat until caramels melt and mixture is smooth. 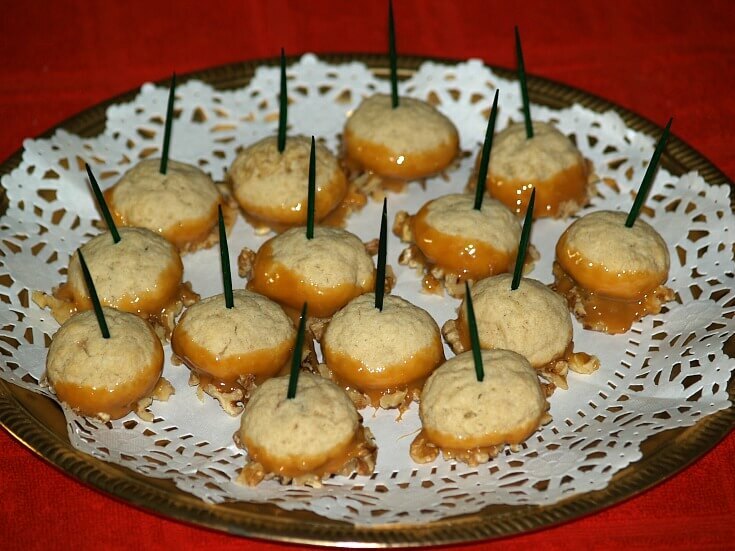 Insert toothpick into each cookie; dip into caramel until covered. Allow excess caramel to drip off; dip bottoms into nuts. Place on rack or parchment paper to set; makes about 30. Great flavors of apples and spices make this one of the delicious recipes for fall cookies. 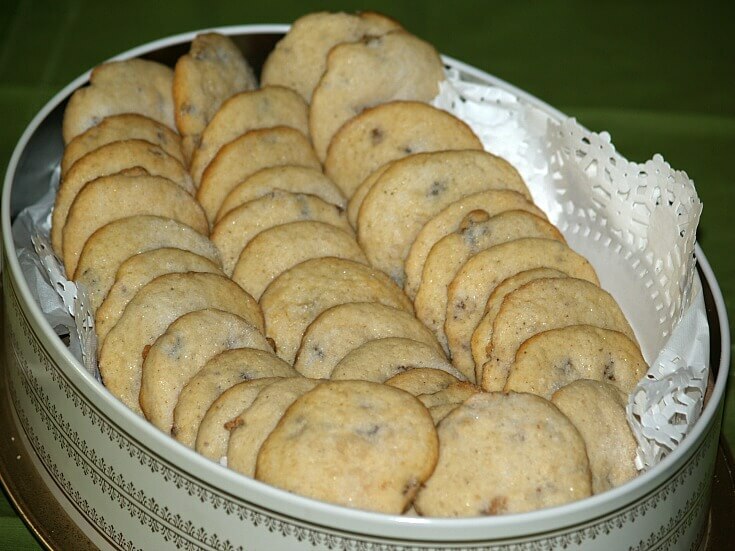 TO MAKE COOKIES combine sugar, shortening and eggs in large bowl. Add coffee and applesauce to shortening mixture; blend. Stir in flour, baking soda, salt, nutmeg, cinnamon and cloves. Stir in raisins and nuts; cover and refrigerate at least 2 hours. Drop dough by rounded tablespoonfuls 2 inches apart on greased cookie sheet. Bake 9 to 12 minutes until set; cool and then frost with glaze. TO MAKE GLAZE combine and mix all ingredients to spreading consistency. Huge piles of pumpkins are everywhere waiting to be used in recipes for fall cookies, pies, cakes and breads. 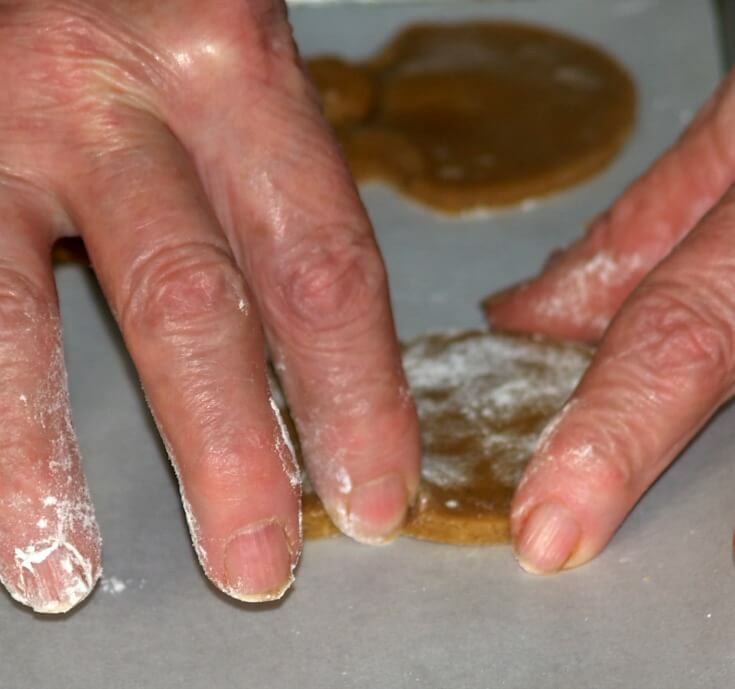 TO MAKE COOKIES combine flour, baking powder, cinnamon, soda and nutmeg. In large mixing bowl cream butter; beat in sugars until fluffy. Add egg, pumpkin and vanilla beating well to blend. Add flour mixture to creamed mixture mixing until well blended. Stir in raisins and nuts; drop by teaspoonfuls 2 inches apart on greased baking sheet. Bake 10 to 12 minutes; cool on cookie sheet for 5 minutes. 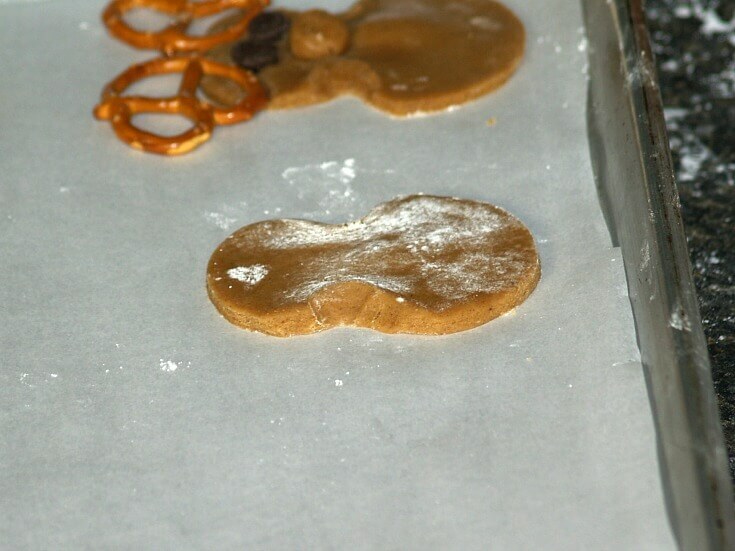 Transfer cookies to rack to cool completely. TO MAKE FROSTING cream cheese, butter and vanilla. Gradually add powdered sugar beating until smooth. Spread a little over each cooled cookie. Maple flavoring also reminds me of fall. Even though maple is harvested in the spring, I have always enjoyed it in the fall and winter. Fall is when we really enjoy pancakes, waffles and biscuits with delicious maple syrup. Maple really adds to recipes for fall cookies. Cream together shortening, vanilla, maple, brown sugar and eggs; set aside. In another bowl stir together flour and soda. Add flour mixture to creamed mixture alternating with sour cream. 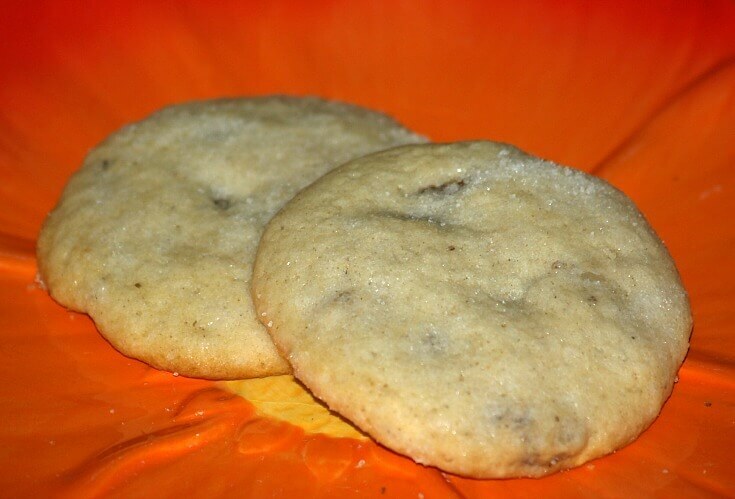 Drop by teaspoon onto lightly greased cookie sheets; bake just until brown. Cool completely on wire rack; make icing. FOR ICING melt butter and cool to room temperature. Stir into icing the maple and milk; stir in sugar to spreading consistency.